My daughter has a variety of toys and one of her favorites are the Moxie Girlz products. Moxie Girlz are a line of dolls that have awesome meaning! What does Moxie mean? One of the newest that Lydia doesn't have until now is the Moxie Girlz- Ice Cream Bike With Sophia. Moxie Girlz have ice cream for sale! Come along for bicycle fun, where ice cream treats stack sky high! She loves nature, animals and the world. She's a writer and feels she can use words to shape the world! She recycles and feels going "green" is especially important in this community where they don't even recognize the color green. She's about doing the right thing and spends time doing things to help others. She can be sarcastic which her friends don't always understand. You can find Moxie Girlz at a local retailer near you. Walmart, Target, Toys R Us and Amazon are just a few of the retailers. 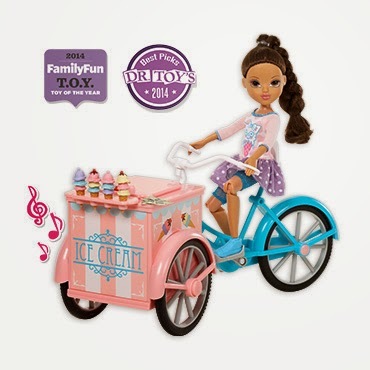 You can find Moxie Girlz- Ice Cream Bike With Sophia for the retail price of $34, give or take a few dollars! I am recommending this toy for my 2014 Holiday Gift Guide! This will make a cute gift for the little girl in your life! Visit Moxie Girlz on their social media below to stay up to date with the latest! WIN IT: One reader is going to win (1) Moxie Girlz- Ice Cream Bike of their own. Giveaway will end on 11/14/14 at 11:59 PM CST. Giveaway is open to the Continental USA. All entries are subject to verification. See sidebar for complete giveaway rules. Enter below. Goodluck! I'd love to win this for my daughter because she would enjoy the music. Musical instruments are on her wish list this Christmas. I would like to win this giveaway for my niece. She would love this. I would like to win this giveaway because I need some girl presents for Christmas and this would be perfect! I think this toy is absolutely adorable and I know my daughter would love it! The ice cream bike is adorable (the doll is cute too). I would like to win this for my granddaughter. My daughter would love it because she likes to play pretend a lot. I would love to win this for my daughter because she loves Moxie girls!! Oh I would love to win this for my niece! She just gave me a list, and this was #1 on it! We are on a very tight budget this year as we lost our home this year and I would love to win this for my daughter for Christmas! My daughter would love this set! She is into dolls right now. I have 2 daughters i think would like to play with this together. Either one of my nieces or my two daughters would love to have this. She is so cute! I want to win this because it would make a nice Christmas gift for my daughter. The biggest thing on her wishlist is My Little Pony stuff. I would love to win this for my niece. My daughter has frozen toys and AG dolls on her wish list. My daughter would enjoy this because she's starting to get into dolls. Would love this for my niece she's a princess so love to spoil her! She's adorable! There are a few little girls in my life who would like to find this under their Christmas Tree. Currently on the list are toy horses and a wooden stable. I would love to win this for my oldest daughter. She loves dolls and this would make a great gift. My two girls would love monster high dolls and any other dolls. My two girls are wanting anything Barbie, Monster High, Ever After High, Frozen, Doc Mcstuffins. The list could go on. I would love to win this for one of my girls. They love dolls. I would love to win this for one of my girls. They love playing with dolls. I'd love to win this for my girls. I'd like this for my niece. She is a huge Moxie fan. My two daughters would love New comforter sets and jewelry.